Identification: This evergreen tree reportedly grows 70-100 feet tall. Its leaves are alternate, grayish-green and leathery with parallel veins. The bark, white and spongy with black fire scars, peels off in strips. The fruits are described as round or cylindrical woody capsules, producing 200-300 seeds. M. quinquenervia is one of almost 200 species in the genera Melaleuca; the vast majority in this genera are shrubs. The difference between this and other species is the flower structure and color. White spiky flowers cluster as cylinders, about 50mm long, resembling bottle brushes with stamens organized in bundles. Current Distribution: Places mentioned above and in the United States, M. quinquenervia has been established in Central and South Florida. The northernmost Florida counties in which it can be found are Hernando, Lake and Brevard. Estimates of the distribution vary from 450,000 acres to several million acres. Melaleuca has successfully been established in pine flatwoods, hardwood bottomlands, cypress forests, freshwater marshes, sawgrass prairies, mangrove communities and in neighborhoods. M. quinquenervia has been reported in Louisiana and on the islands of Hawaii but little research is available about those invasions. Site and Date of Introduction: Introduced to Florida in 1907. It was introduced separately in the east and the west of the state. Mode(s) of Introduction: M. quinquenervia was purposely introduced as an ornamental in Florida. Later, it was seen as beneficial by developers for drying up wetlands. 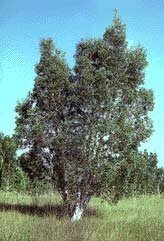 In Hawaii, melaleuca was used in reforestation projects. Reason(s) Why it has Become Established: It has escaped cultivation and propogated so well because of its reproductive capabilities and high degree of disturbance tolerance. Each fruit of this tree produces 200-300 seeds. The small, lightweight seeds are carried by water and wind. Seed release is triggered by disturbances like fire, herbicide application, physical harm, frost or triggered naturally when conductive tissues are interrupted. Trees can also propogate from branches if they fall on receptive areas.M. quinquenervia is exceptionally sturdy, able to tolerate mild drought, water table changes, and a wide range of other disturbances. Its inability to deal with frost has kept it from becoming establishing in areas north of Central Florida. M. quinquenervia's success in Florida results from the absence of parasites, predatory insects and fungi that exist in Australia. Ecological Role: In Florida: Smaller populations of small mammals and their predators have been found in M. quinquenervia stands of intermediate density; the dense stands are considered "particularly poor" for wildlife. Recent research show that stands of intermediate density retain 'significant habitat quality.' These dense stands have been shown to provide cover for endangered species like the indigo snake and the tree is a preferred nest for the snail kite, also an endangered species. Increasing numbers of upland, tree-residing and forest fauna species have been noted in intermediate tree stands. No animals are known to eat M. quinquenervia seeds. M. quinquenervia tends to colonize sparsely vegetated areas so they do not compete with other plant species. In Australia: Meleuca is found in wetlands and swamps and sometimes along coasts. There its population is held in check by several insects including Eucerocoris suspectus , the Fergusonina gall producing fly, Pomponatius typicus, Lophyrotoma zonalis (leaf eater); and fungi like Botryosphaeria ribis. Benefit(s): Due to its widely noted transpiration ability, quick growth and spread, M. quinquenervia is considered good for erosion control, flood control and maintaining water levels that may change with encroaching developments. M. quinquenervia is used in a variety of commercial products including antiseptics, beverages, shampoos, perfumes, honey, candy, ice cream and tea tree oil (used as a germicide). Threat(s): This tree establishes exotic monocultures where it grows. These dense thickets block out light and provide poor habitats for native species and prevent growth of understory vegetation. Further, their evapotranspiration rates, while disputed as high or average, still alarm conservation groups interested in preserving wetlands. The dense stands cause the buildup of 'tree islands' in the wetlands as litter from branches, leaves accumulate. While tree islands are not unfamiliar in the Everglades— they provide habitats for alligators, small mammals and birds—the heavy concentration of these tree islands could fundamentally change wetland ecosystems and, with the destruction of the ecosystem, hurt the Florida economy that depends on visitors to a unique ecological habitat. The trees are fire-prone. The leaves are resinous and tend to burn hotter and faster than the grasses in wetlands. The higher temperatures reduce survival of competing plants. Although the M. quinquenervia seedlings do not survive, adult trees are very fire resistant and recover rapidly. M. quinquenervia can reflower within weeks of a fire. Control Level Diagnosis: Highest Priority. While experts agree that the tree can not be completely erradicated from Florida, the need to curb its spread is urgent. This species is changing a singular, unique ecosystem, the wetlands, by forming completely exotic monocultures that do not provide foraging prospects or a preferred habitat for more than a few species. In addition, these trees threaten to extirpate native tree species and all understory vegetation in ecosystems it inhabits. Many control methods which have proven effective in other cases actually increase melaleuca propogation. Disturbance such as herbicide application causes seeds to be released. Burning the trees also releases the seeds, and trees releaf soon after herbicide application. Other methods of control are ineffective because of melaleuca's high tolerance of changing water levels, its salinity, and drought. The possibility of manipulating water levels to control this species show that M. quinquenervia is adapted to endure long periods underwater and seasonal flooding because of deep adventitous roots. Flooding does not affect seed viability either. The melaleuca snout beetle (Oxyops vitiosa), a species native to Australia, was released into 15 locations in Florida in 1997 after testing in quarantine proved it to be a pest specific to melaleuca. It's too early to evaluate its effects on melaleuca control, but researchers don't expect the beetle to eradicate the species, only slow the spread and make trees more susceptible to other control measures. Association for Biodiversity Information. NatureServe: An online encyclopedia of life. 2001 (October 17, 2001). Version 1.5 . http://www.natureserve.org/. Center Ted D, Van Thai K, Rayachhetry Min, Buckingham Gary R, Dray F Allen, Wineriter Sue A, Purcell Matthew F., Pratt Paul D. Field Colonization of the melaleuca snout beetle ( Oxyops vitiosa) in south Florida. Biological Control. 19: 112-123. Davies K A., Makinson J., Purcell M E. Observations on the development and parasitoids of Fergusonina/Fergusobia galls on Melaleuca quinquenervia (Myrtraceae) in Australia. Transactions of the Royal Society of South Australia. 125: 45-50. Lockhart C. Austin Dan F, Aumen Nicholas G. Water level effects on growth of Melaleuca seedlings from Lake Okeechobee (Florida , USA littoral zone. Environmental Management. 23: 507-518. Lodge Thomas E., 1994, The Everglades Handbook. Understanding the Ecosystem, St. Lucie Press, DelRay Beach, FL. O'Hare Nancy K. Dalrymple George H. Wildlife in southern Everglades wetlands invaded by Melaleuca (Melaleuca quinquenervia). Bulletin of the Florida Museum of Natural History . 41: 1-68.